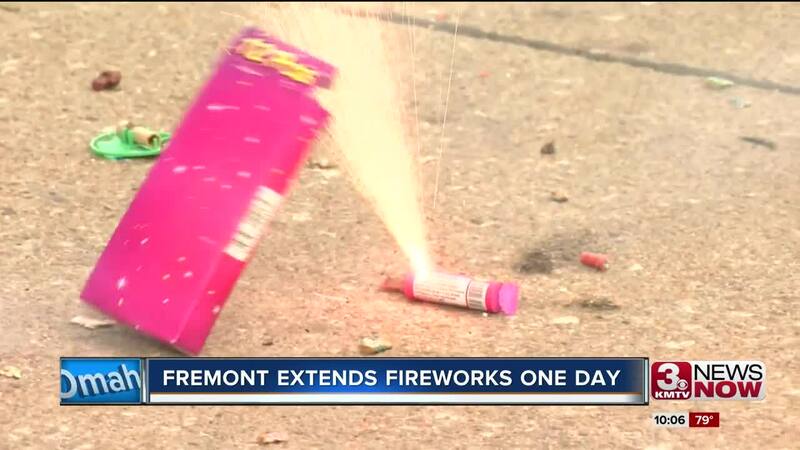 The city of Fremont allowed fireworks to be discharged until midnight July 5. Due to rainy conditions Wednesday evening, Mayor Scott Getzschman announced on Thursday the fireworks ordinance would be extended. Other surrounding cities, including Omaha, were not able to discharge fireworks as the city ordinance only allows fireworks until July 4. Ronald Zaim, a Fremont resident told 3 News Now he was excited he had an extra day to discharge fireworks. "This year I spent about $300 on fireworks. Usually, I spend twice as much," said Zaim. "When I first saw the extension announcement on Facebook I thought it was a joke, but I did some research and discovered it was true. I'm grateful for that because with the rain, I wasn't able to light them all." Eric Hardy manages the Ka-Boomers Fireworks stand. He said it was a busy fireworks season in town with adult customers averaging about $80 worth of fireworks per visit. "Business is slow in the beginning but then like every year, it picks up a lot in the last few days. The last few days we had eight people working the stands and we worked until close," said Hardy. Hardy said the city has been loud with fireworks since Tuesday, but didn't think the ordinance extension would impact the city too much. "There were so many Fourth of July parties yesterday so I doubt people will be as extravagant with them today," added Hardy. Some residents told 3 News Now they weren't thrilled about the extension because they work early Friday morning and didn't want to hear the fireworks until midnight. Reports of an extension through the weekend in Council Bluffs were speculated about on social media, but Mayor Matt Walsh said Friday that the city was absolutely not extending its allowance.